Posted June 26, 2009 in Best of Simon & Kirby, Topic. 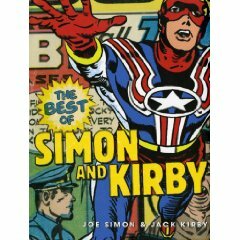 Amazon is still saying the release date is May 12, but “The Best of Simon and Kirby” has been appearing in comic book stores across the country. I have decided to keep a running post for reviews and such. Readers are encourage to leave comments as well. If this sounds like a shameless plug that is only because it is a shameless plug. I want “The Best of Simon and Kirby” to be a great success. Remember this book has been authorized by Joe Simon and the Jack Kirby Estate. Newsarama has a preview of the entire Blue Bolt #4 story, if you have never seen Simon and Kirby’s Blue Bolt, or worse yet are only familiar with it from the 1998 paperback, you are in for a pleasant surprise. Newsarama has an extended interview with the art restorer for this book. If you did not know who that is, that would be me. There seems to have been a lot of comments and reviews of “The Best of Simon and Kirby” on the Internet. The latest quotations and links that I provide below are very likely to be incomplete as I do not have the time to do a thorough search. Included are a couple of interviews of Steve Saffel (the book’s editor). by Charles R. Rutledge in Singular Points. Rutledge provides a nice overview of the work of Simon and Kirby. This short comment means more to me personally then any of the reviews of The Best of Simon and Kirby. Bob’s blog is the place to go to get the latest news about all upcoming publications about Jack Kirby. He even has scooped me on news about this very book. I missed getting a copy of Comic Shop News #1146 last week which prominently featured The Best of Simon and Kirby in an article by Cliff Biggers. It includes an interview with editor Steve Saffel where Steve says some highly complimentary things about me. Steve also has done interviews in Forces of Geek and by Avi Weinryb in Comic Book Bin. That last interview provides the surprising information that Amazon lists the superhero volume with a release date of December 31, 2035! I am hard at work on the art restoration for that volume and I can assure you that it will be out much, much sooner then that!